How the Year of the Monkey affects you! Welcome to the Chinese year of the Monkey. 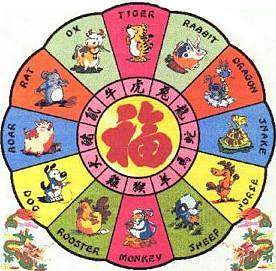 February is the commencement of the solar Chinese New Year, traditionally starting the year on the 4th February beginning a new zodiac animal cycle. The New Moon of 22nd January 2004, however, is the official lunar New Year celebration day for the Chinese community. 2003 was the year of the Water Goat. Now in the cycle of twelve animals comes the trickster Monkey. The Monkey is a lively and active animal who enjoys dynamic discussion and competition. He is intelligent, cultivated and eager for knowledge. He's an adaptive, bold, social and alert creature with powerful survival skills. He likes variety and stimulation. He can lose time busying himself in the affairs of others and likes to strike attitudes and play with words. The Chinese character for Monkey is the word 'shen' which is about the quality of constant movement affecting everything around. Monkeys have remarkable energy for all sorts of possibilities with which they can endow any situation. What can we expect in a Monkey year? Monkey has such a reputation for action, energy, tricks and variety that we can expect to see a lots of shifts in the world this year. Monkey years show much activity behind the scenes where things develop in secret then burst suddenly onto the scene. This can be in the field of politics, social movements, technology and the rulership of countries. Many countries will experience unrest and even dissolution of established rulers this year. The symbolic picture of the year is yang Wood, the upper element, sitting on top of yang Metal (the Monkey). In the Five Element system, Metal attacks the Wood element and cuts it down, so with Wood sitting on its destroyer Metal, its indicator of disharmony and this may give rise to more international conflict. The yang Wood of the year is like a tall tree with much pride sticking to uncompromising principles. Metal sitting under Wood is like a sword cutting the roots of a tree killing it underneath. This image shows us serious political struggles causing upheaval and the overthrow of governments. Its a year made difficult by lack of compromise and it won't be easy to bring about peaceful settlements of problems. When was the last Wood Monkey year? In 1944 in the middle of World War Two. The D-Day invasion at Normandy began on 6th June with the allied forces set to attack German forces across Europe. In the Mediterranean allied forces landed in Casino and began a push across Italy. The American forces in the Pacific began the invasion of Guam in their first big push against Japanese forces beginning a sweep across Asia and as a result Burma, the Philippines and Vietnam were mostly freed of Japanese forces. It was a dramatic year in the war. Today the same potential exists. We may see larger terrorist attacks and subsequent campaigns and more dramatic reversals of fortune for many countries and their leaders. In the year of the Monkey events can escalate very quickly as its the nature of the Monkey to push things to extremes. Restlessness, too much scheming or manipulation could be a product of the year and it could be a time of erratic reversals of fortune in all fields. Look especially at the stock market as money is ruled by the Metal element. Look also at big business and the fortunes of international companies across the planet. If you wish to invest this year be cautious. Medical and scientific breakthroughs are very possible for 2004 as is the change of attitude from people towards leaders and authorities. There could be a big shifting of attitude towards government with people being more concerned in their own personal spiritual development and disillusioned with the promises of politics. A spiritual awakening may be very much part of the year with renewed concern for the environment being a driving force in 2004. Wood element is the wind in the natural environment so excesses of wind - hurricanes, tornadoes, storms, floods and wildfires could be a feature of the weather. Indeed with Wood and Metal out of balance, the structures of cities (ruled by Metal) could be undermined or damaged by large scale wind-driven weather. Water is the linking element between Metal and Wood in the natural elemental cycle, so much water is needed to bring about a balance. This could mean floods and inundations or it could mean the soothing waters of compromise and co-operation. The Chinese system counts in twenty year cycles and one number dominates the period, this number being used in Feng Shui to assess a house or building. The cycle just finishing has lasted from 1984 to 2003. Its been ruled by the number 7 which is the trigram 'Tui' in the I Ching. Its called a trigram as it has three lines, either broken or unbroken making it up. The 7 energy is of the creative, the young and free. This is the energy of innovation and new spiritual energies. Its represented by the female in the form of a young girl and thus the spirit of the times since 1984 has been about the rise of female focused emphasis in society. Gradually over the last twenty years we've seen the rise of the goddess and the need to do things in a more creative feminine way. Its meant increased awareness and new knowledge, new information and new experiences. Its also been about media and increasing the capacity for socialisation. Its been about freedoms, seductions and sexuality. The extreme of the manifestation of 'Tui', the young girl, is society's obsession with the young female fashion model suffering from anorexia and looking increasingly younger and younger. Hopefully, this obsession will pass as we move to the next number. Now the 'Tui' cycle ruled by number 7 is finishing and the next cycle of number 8 is beginning. It lasts from 2004 until 2023. It has the trigram 'Ken' and its more of a masculine energy but like that of the monk sitting in contemplation on the mountain. Its called 'mountain' in the I Ching. Ken energy brings in many new things. The monk is genuine, wise and mindful. He has the experience and so knows how to discriminate. Ken has enormous reserves of spiritual energy and quality. It represents accumulation of wisdom and abundance because it has gathered things together over a long time, as mountains do. This new 'Age of Eight' then is going to take us towards a resurgence of the spiritual within society. We will come into a deeper contact with ourselves and our own natures and the world around us. In social systems where the structure is just not working for all or its ruled by excess cruelty and material indulgence at the expense of others, the excesses have the potential to increase until they reach their worst and collapse under the weight of disgust or rebellion from citizens. Searching and questing for meaning will take us to a more solid foundation (8 is earth mountain) over the next cycle for the practical application of higher spiritual principles in society. As number 8 also represents the younger man, then younger world leaders with new ideas will move into places of power. It will bring out the very best amongst ordinary people. The Ken energy will definitely not support gurus anymore as it carries such a strong self-determining energy for growth. Many ordinary people from ordinary backgrounds will rise to become themselves in strength and be recognised for their honest spiritual qualities. The age of the special 'chosen' people is ending. There will be significant shifts of power and privilege over the next twenty year cycle as Ken rules the earth and the resources of the world will become viewed in a new and more balanced way. Ken is about symmetry and seeks the most beneficial experience for everyone. So wealth will be slowly reapportioned and understood in a new way. Land, housing, building and the use of mineral resources will be rethought over the coming years. We may begin to build structures on the land in a new way as the energies of Ken sink into the human race. Because of its earth energy association, the number 8 will also bring on changes in the earth's structure and we may see more earth movements, earthquakes and shifting lands brought on by big changes. Perhaps some land will go underwater and other new land will rise from the seabed in the next twenty years. It all promises challenging and exciting times. The year 2004 with Monkey energy ruling begins the changes. Click here to read how the Year of the Wood Monkey affects you!